If you want your little ones to have an appreciation for the outdoors simply make some nature discoveries. In your own backyard just start looking around for the little things that are amazing. Creating a child that has a love of nature, the backyard kind of nature to the big beautiful mountains kind of nature, starts with showing them the nature that they walk past everyday. or simply dig a hole to bury something! I just couldn't pick. There were two mommas that rocked my world this week with their awesome play and inspiring ideas. Growing Play: One Step Further had an awesome competition going on at her house...who can stay outside the longest! Genius!! And Frog, Goose and Bear had the most amazing camping trip! I would love to be a kid in this family. Who wouldn't love to have a sculpter in the family that can just whip up some great works of art on a camping trip? Go and check out these great posts if you haven't seen them already! Thanks ladies for linking up. 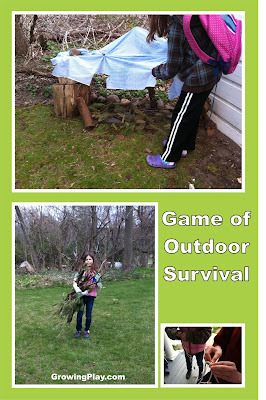 You are going to have some outdoor loving kids that will turn into outdoor loving grown-ups!